Our Processing unit has a daily production capacity of 100 Metric Tons. It is equipped with the latest automatic processing machinery which ensures that quality of our product is always consistent to the requirements. The peanuts pass through sortex machine which is equipped with 12 high resolution cameras that can identify and remove all foreign impurities. Quality is our foremost priority. 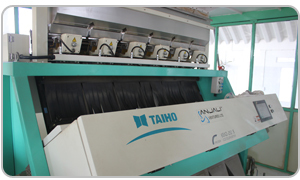 The process conditions are constantly monitored and regulated to ensure the quality standard. The final product is released only after a thorogh laboratory analysis. All the staff working at our factory are required to wear the prescribed uniforms, Maintain the required hygiene levels and have undergone all required immunizations and vaccinations. Quality Check : The peants bought from the farms undergo a strict quality check and are unloaded only after approval from quality control department. 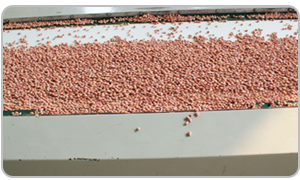 Pre Process Cleaning and De-stoning : The in-shell peanuts are separated from dust, mud, heavy stones, stalks, leaves, undeveloped pods and small in-shells by a classifier separator and in a de-stoning machine. Shelling : The peanut kernels (red seeds) are removed and separated from the outer thick yellow shells. Classification of in-shells and kernels : At this stage impurities such as in-shell peanuts, damaged and very small kernels are removed. Centrifuge-Vibro Separation : This process involves separating lighter materials such as husk, shells, small kernels, etc. from heavier peanut kernels by subjecting the mixture through centrifugal and vibrating motion. Gravity Separation : This Machine uses the principle of gravity by lifting the mixture in air and then separating heavy as well as light impurities e.g. removing impure matter such as shriveled kernels, ergot, light kernels, pods, stones etc. 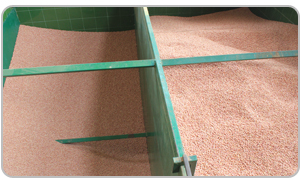 Colour Sorting : The peanuts then pass through the process of optical inspection by which contaminants such as discolored peanuts, dark peanuts and foreign materials are removed from final product. We use Sortex machine for this process : It is a combination of the most advanced high resolution cameras that identifies the widest range of foreign material, extraneous matter, smaller spot defects, finer product demage by subtle colour defference. Uniform Grading : Grading is the process of separating out broken kernels and grading the nuts in uniform size by diameter and thickness. Packing : Peanuts are packed according to the buyers specification. Vacuum bags, Jute bags, food grade HDPP bags, woven PP bags and jumbo tote bags can be used to pack the finished products.